Are you seeking for an energetic activity yet seeing beautiful views simultaneously? Bali should be in your travel plan. This trip combines diverse activities: cultural and natural attractions, delicious food, plus a long bike trail along the left bank of the river. One of the newly established notable attractions of Bali is the Shihsanhang Museum of Archaeology. The appearance of the museum has won awards for its architectural design. It exhibits the life of Shihsanhang civilians in the past, and how archeologists discovered the site. The museum is surrounded by a large grassy park and bike trails. Visitors may also rent a bike and travel around this town. The admission fee of the museum is TWD 100, and the museum opens on Tuesdays to Sundays. The distance from MRT Guandu Station to the museum is about 4 km. You may choose to take a bus, ride a bike, or walk to reach the museum. 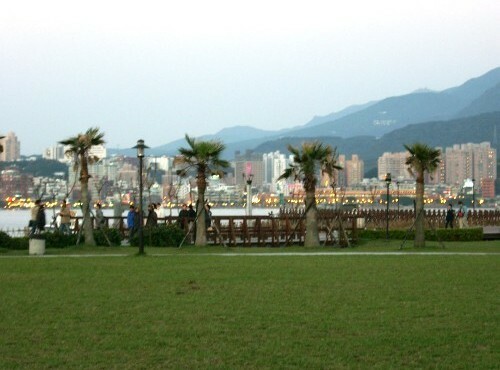 Along the way, you will be able to see the beauties of Danshui River. If your energy runs out while traveling, you might choose to stop and try some Taiwanese snacks. One of the famous Taiwanese snacks here in Bali is the mussel cuisine. Fresh mussels are cooked in different methods: pan-fried, steamed, or stewed. Another interesting Taiwanese snack to recommend is Shuangbaotai, which means the twin-donut. If you cannot find where they are being sold, just follow the crowd! Shuangbaotai is usually sold for TWD 20 each. Another popular site among visitors is the wharf at the left bank of Bali. The wharf was newly renovated, and it connects to Danshui Old Street and Fisherman’s Wharf. Furthermore, it is also a popular photographing spot. Don’t forget to say “cheese” when you visit this place! Visit http://tour.tpc.gov.tw/English/images/tour08/map080.gif for more information on Bali tourism. Close to Danshui, Bali is where you can bike along the beautiful left river bank for precious wetland sceneries, mouth-watering Taiwan snacks, and visit the Shihsanhang Museum of Archaeology which has a distinctive architectural design with displays of the former Shihsanhang area.